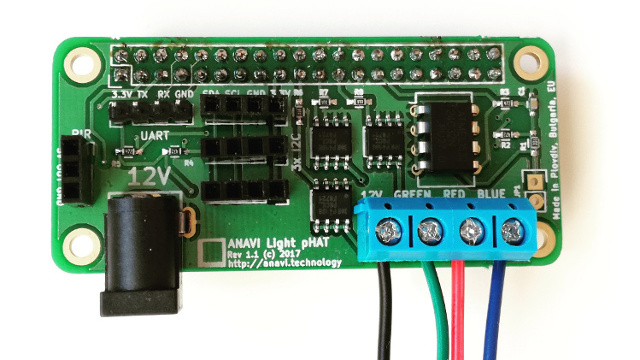 Note: ANAVI Infrared pHAT is compatible with any model and version of Raspberry Pi with 40 pin header. 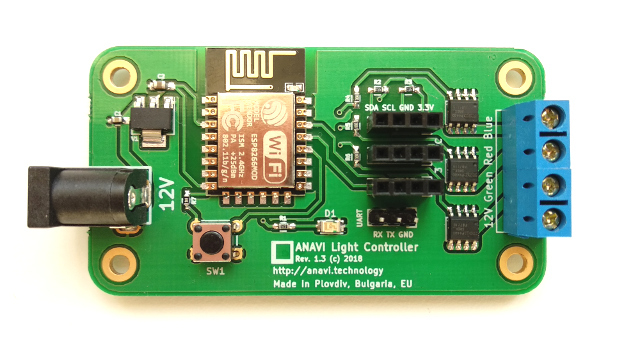 Note: ANAVI Light pHAT is compatible with any model and version of Raspberry Pi with 40 pin header. 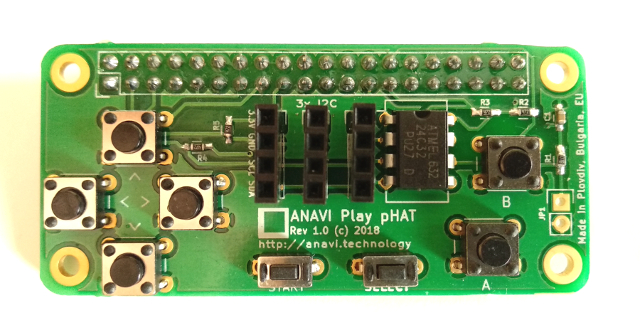 Note: ANAVI Play pHAT is compatible with any model and version of Raspberry Pi with 40 pin header. Flexible HAT for Raspberry Pi suitable for do it yourself (DIY) weather station, automated desk assistant or prototyping Internet of Things (IoT). 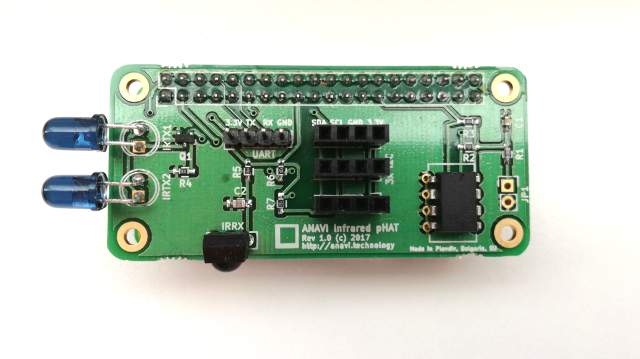 Note: ANAVI Flex HAT is compatible with any model and version of Raspberry Pi with 40 pin header. 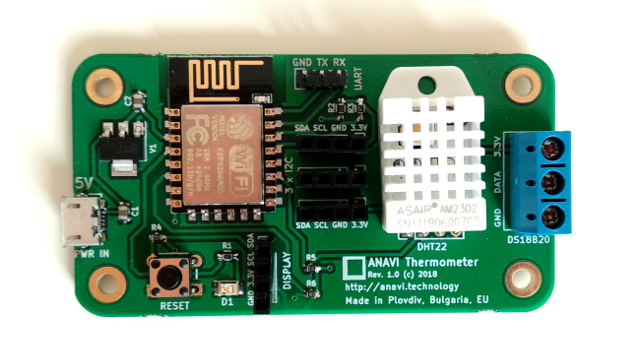 Easy to mount I2C sensor for measuring temperature and barometric pressure. Easy to mount I2C sensor for measuring humidity and temperature. Easy to mount I2C sensor for measuring illuminance. Easy to mount I2C sensor for detecting RGB colors and simple gestures. Waterproof 1-wire sensor for measuring temperature in liquids, for example fish tanks. Yellow-blue OLED I2C display. Compatible with any dev board with I2C. Simple and easy to mount LCD display module with 16 characters on 2 rows. Compatible with ANAVI Flex HAT. My name is Leon Anavi. I am a software engineer and an open source enthusiast. I am passionate about open source technologies and you might know me as a speaker on various conferenes. I also maintain a YouTube channel and an unfashionable old style personal blog where I publish geek videos and tutorials for programming and do it yourself (DIY) devices. I have been a proud Raspberry Pi owner since 2012 and I still enjoy experimenting with the new versions of the board in my spare time. I have been fascinated by open source for many years. I have huge experiece with open source software but making hardware is completely different story. In 2016 I started my new exciting journey in the world of the open source hardware. With some help from faithful friends I stared making hobby add-on boards for Raspberry Pi and IoT. My goal is to create open source hardware with free and open source only. Therefore I use KiCad on Ubuntu Linux distribution for designing the printed circuit boards and OpenSCAD for the enclosures. Since the beginning of 2017 my open source hardware devices have been made locally in my hometown and they proudly wear the sign Made in Plovdiv, Bulgaria, EU. They are certified by the Open Source Hardware Association. I am running modest crowdfunding campaigns to fund low-volume manufacturing of each new product. I launched my first crowdfunding with IndieGoGo but after that I quickly switched to Crowd Supply because they value open source and provide better support. You can purchase my open source hardware from Crowd Supply, Neven.cz and Pi Supply. To keep low carbon footprint and low retail prices of the open source hardware we are manufacturing locally, optimizing transportation, sourcing components carefully and relying on trusted distrubutors around the world. Crowd Supply is shipping from Portland, Oregon, US, Neven.cz from Brno, Czech Republic and Pi Supply from the UK. All ANAVI products and kits are with eco friendly packaging from recyclable cardboard boxes. Over the years as a software engineer I learned that the major difference between a circuit board and a stone is the software. Without proper drivers and software support any circuit board is useless. My goal is to make developer friendly hardware by providing software support and documentaion with the exact steps how to use it. Suggestion, recommendations and GitHub pull requests are always welcome! Please do not hesitate to contact us at info@anavi.technology if you are interested in learning more, ordering any of our products or becoming a reseller. Please send any inquiries to info@anavi.technology.